Hi friends! I am so excited to announce the Bite Tonight has launched it’s new site. Please visit http://www.thebite2night.com. There are 4 brand new posts for your viewing pleasure as well as a fresh new look. Please subscribe to the new site so you don’t miss any posts. I will be posting weekly write ups on the new site and will no longer be posting on here. More professional pictures with my new DSLR camera. I got a Canon Rebel guys! Woo hoo! Located on West Rd in Brownstown, Xtreme Nutrition just celebrated their 5th year Anniversary. Xtreme Nutrition offers everything for your health and work out needs. Their inventory blew me away and I didn’t even know half of the products existed before stopping in. Snacks and protein bars, health and sport supplements, clothing and merchandise, and lifting accessories fill the shelves. Also, you can find many food items such as drinks, beef jerky, frozen meals, breads, pasta, and chips. Can you tell I like dried meats? Ha! Looking for something different after a work out? Check out the Protein Chocolate Cheesecake: Everything you love about cheesecake with protein. Super creamy and light. You can now feel good about indulging! This is right up my alley. and Chocolate Proyo with slivered almonds (protein frozen yogurt): Tasty! It was a nice change from the same old protein shake or drink. You also didn’t get that weird protein taste that you sometimes get from flavored shakes or drinks. *New expanded PROYO line now offering Vanilla. You can also find a variety of toppings and drizzles including low fat PB & J, no sugar added Dark Chocolate, and Caramel drizzles. Chocolate not doing it for ya? Feeling like something fruity? Grab a smoothie! Xtreme Nutrition is blending up smoothies right before their customer’s eyes. The staff is super knowledgable and helpful. They are dedicated to assisting customers in finding exactly what they are looking for. Since they are a small business, they are able to keep prices low and affordable. Visit the website and sign up for the newsletter to receive a 10% off coupon. Located on 9 Mile Rd in Downtown, Ferndale, MI is Public House, part of the same restaurant group as taco and hot dog spot, Imperial. Chef Brandon Zarb and the Public House team are cranking out New American style cuisine offering a diverse menu including gourmet sliders, small plates, dessert, and brunch. Dottie: Hot mustard, horseradish, soy sauce, Sriracha, lemon. Not the best Bloody I’ve had, but OK. Considering this had hot mustard and Sriracha I expected it to be a lot spicier than it was. I didn’t care for the lemon, but I really liked the onion in the garnish stick. This was a refreshing change from the same old celery stick I am used to. The smoky seasoning on the glass rim was my favorite. It paired well with the spice from the mix. Hushpuppies: Proscuitto and maple butter. Savory and sweet, which I didn’t care. I am used to hushpuppies being savory and served with cocktail sauce or some sort of vibrant condiment. I can get down with sweet hushpuppies, but I didn’t really understand how the prosciutto played in. Was I supposed to eat it with the hushpuppy and maple butter? Or did it act like a palate cleanser in between bites the way pickled ginger does (Kidding)? Because this was exactly what it looked like. Regardless, these puppies were bland. The outside was crispy, but the inside was dry. The maple butter was good, without being overly rich, but the hushpuppies needed something more as a dipping sauce. 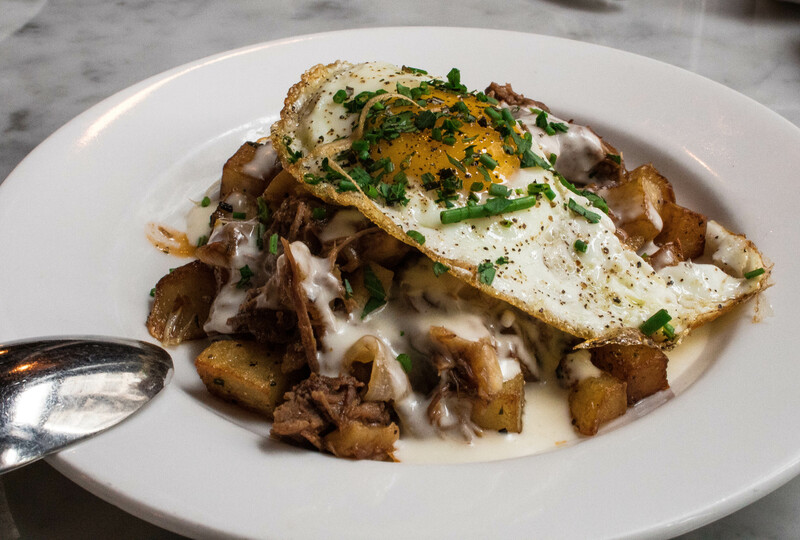 Smoked Brisket Hash: Smoked brisket, red skinned potatoes, shishoto peppers, Sriracha aioli, two fried eggs. The brisket was tender, but there wasn’t a whole lot in the hash itself and some pieces were all fat. The red skinned potatoes were crispy on the outside and tender on the inside. I really liked the Sriracha aioli. It added a nice spice and richness to the hash. The shishoto peppers were good, but charred and too crispy. I didn’t like that grease collected in the bottom of the plate. Nashville Hot Chicken slider: Dill pickle, buttermilk dill sauce, toasted brioche. I was excited to order this, but was disappointed when it came out. There was little sauce on the slider and absolutely no heat. I asked our server for a side of hot sauce which made the sandwich better. The pickles added a nice crunch and paired well against the fried chicken. The chicken was dark meat (which tends to be juicier than white meat), but still dry. Smoked Brisket & Egg sliders: Brownwood mustard, Swiss cheese sauce, cucumber pickle. fried egg on toasted brioche. I really enjoyed the bold mustard with the tangy Swiss cheese sauce. The brisket was a tender, thick slab of meat on a soft, yet toasty brioche bun. The sliders come with sweet potato chips (or so says the menu), but when they came out the chips were missing so I had to ask our server to bring them. I liked that they were thinly cut and crispy, like an actual chip. Lightly finished with salt which added a nice balance to the sweetness of the chip. The sliders were tasty, but I still prefer Green Dot Stable’s. Service was meh and our server lacked in the knowledge department. She didn’t know if the pickles were made in house or if they were sweet versus dill. She wasn’t very attentive to detail, either. For example, I ordered a side of hot sauce for my Nashville Hot Chicken. This would normally prompt most to ask if there was something unsatisfactory about my dish, since this is normally an already spicy sandwich, but nothing. Public House also doesn’t allow substitutions. I understand not allowing ridiculous substitutions, you have to draw the line somewhere. When it’s substituting sweet potatoes for red skinned potatoes (because sweet potatoes make Emily queasy), I don’t see the big deal. Especially when some brunch hashes come with red skinned and some come with sweet potatoes. What happened to enhancing the diner’s experience? Public House offers happy hour specials, menu takeovers (tossing out the old menu for seasonal items every couple months), craft beers, a full bar, and adult shakes (oh yeah). You can also catch movies on the patio with Street Side Cinema which is pretty neat. Kudos for playing No Doubt’s Tragic Kingdom album during brunch, which was somewhat nostalgic for me. Visit their Facebook page for the menu and event details (yep, no website).